in-C® – See it in Context – 'Data' becomes meaningful when you see and share it in Context. 'Data' becomes meaningful when you see and share it in Context. Its forward-looking design makes it possible for admins to “live in the present tense” with the inevitable constant flow of changes that must be continuously updated, accessible to all presbytery staff, *printable*, and shared online for churches every day. It’s the best way for a presbytery office to stay organized internally because it understands that people have many different meaningful roles at the same time, over past, present, and future, and it’s the only solution that preserves person and church role history over time. Beyond that, in-C® stands alone because it automatically publishes a user-friendy, presbytery customized Presbytery Web Directory so your churches can immediately see every shared update – with zero extra publishing effort on anyone’s part. So just by staying organized in-house, the results of your efforts are multiplied when in-C® automatically generates and publishes shared PDF directories and updates the searchable web directory for your audience. Visitors can see who’s on every committee, print a PDF roster that’s up-to-date for that moment, and easily pull anyone’s current contact information. This includes committees people have served on, events they’ve attended, renewal terms, boundary training status, and much more. This is the only solution that preserves a history of how people served over time, and where, and the only solution that can show it to you all together in one place in a simple point-and-click environment that doesn’t require any technical skill to use. See and explore your information like you’ve never been able to before. 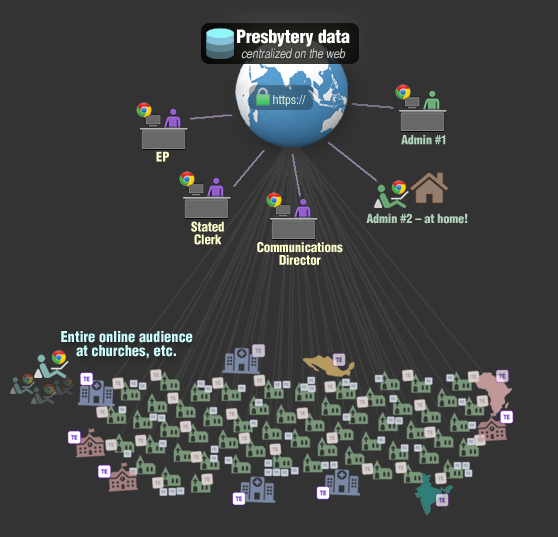 When you update your data using in-C®, you're * automatically * populating a Presbytery Web Directory for your churches where they can get the immediate changes, and also download printable PDF directories and rosters that in-C® made without you doing anything that are up-to-date for that day. Daily publishing hurdles for the staff are eliminated. Open the Presbytery Web Directory to see how. "I have loved working with in-C®. The best part for me is that I can securely work on it from anywhere! The level of detailed information that is in one place for all of our staff to access anytime is a wonderful asset to our presbytery. The customized lookups and phenomenal customer support can’t be beaten. I wish we had switched over to in-C® sooner!" and I need the email address for every youth director, please?" This should not be a hard (or time-consuming) request to fulfill. Because in-C® is roles-based and designed just for a presbytery, there are countless scenarios like the above request that are very easily accomplished. Getting organized today means you're ready to accommodate unpredictable needs and requests like this in the future. ...Dynamically, in just a few clicks, based on the many roles you continue to collect for each person over time. As you can see in the export options above – with the same amount of effort you could have printed mailing labels, exported all the data to excel (mail addresses, phone #s, etc. ), or even placed them all on a google map. You can do this for every result list that you pull using in-C®. "Having now used four different database systems on staff in two different presbyteries, I am convinced that in-C® has the best implementation of the features that presbyteries need to further their mission of supporting congregations in their witness to the Gospel." the two largest presbyteries in PCUSA.